Maestro is a blockchain-based music streaming platform for artists and listeners. Maestro is focusing on fast software development of a smooth service for the music platform. Maestro uses EOS.IO-based blockchain technology. We chose EOS.IO because of its high scalability using parallel CPUs, far superior speed, and free transactions based on DPOS. 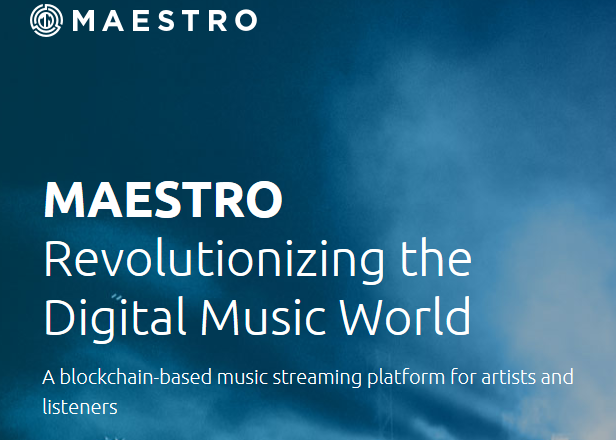 To maximize profits for artists and minimize burdens for consumers, Maestro uses an EOS.IO-based blockchain that does not require any individual transaction fees from users. The cost of the blockchain is charged to the developer using EOS.IO. There are no costs apart from the coins deposited to the developer. We use EOS.IO blockchain technology to increase the benefits of decentralization for all users. Maestro started with such a need, to solve a problem that plagues the music industry today: namely, the unfair structure of the industry itself. Third parties, such as labels and agencies, currently reap in over 80% of generated profits, leaving artists with barely any support and struggling with financial burdens. Music player companies only exacerbate this inequality through inefficient bureaucracy. Music distribution rights are currently monopolized by third parties such as labels and production companies, who have used their influence to control the resulting profits. The inequality inherent in such a distribution structure affects not only artists, but also consumers, who become burdened with unreasonable prices they must pay to enjoy music. Maestro believe that for both music and its industry to thrive, an environment focused foremost on promoting the creative efforts of artists and guaranteeing their fair compensation must be provided. Therefore, a blockchain-based music platform that acts as a creative ecosystem established on virtuous cycles of mutual cooperation between creators and consumers is proposed. Maestro aims to create a transparent industry through decentralization with blockchain technology. By leaving out the "middlemen" from the process, consumers will be able to use streaming services at considerably more reasonable prices. MAESTRO will become the new paradigm for the music industry. maestro will provide an environment that allows for unhampered creation as well as an ecosystem that fairly divides right of song between artist and investors, and profits among all token holders. "To create a productive environment where artists are actively supported, a structure in which the rights of creative works are fairly allocated, and an ecosystem where artists and investors can cooperate to share profits" Maestro's goal is to change the current centralized management system to a decentralized platform among users with blockchain technology. Ultimately, we want to revolutionize the music streaming industry so that the profits returned to artists and investors are more fairly distributed. Inevitably, there will be obstacles to implementing new technology in an already mature music industry. New technology must harmonize with the current industry's structure and has to be accepted by all its stakeholders. Barriers to entry are even higher due to the strong culture and longstanding conventions of the industry. Therefore, Maestro's team will focus mainly on segments where blockchain technology can be realistically implemented. It must reconcile with the existing bureaucratic music industry to make swift progression. Maestro's goal is to decentralize all areas of service. The Maestro team has reviewed the technology for implementing file transmission, streaming, and other functions using distributed servers. The Maestro System will use a distributed server system called IPFS (The InterPlanetary File System) to transmit streaming files. IPFS is a distributed file system that uses a structure to connect computers to the same file system. IPFS has implemented a server- and client-based web using a P2P method. Previously, webs could only be maintained using a centralized server. With IPFS, webs can be distributed and maintained without a centralized remote server. In other words, even if a server becomes inoperable, the files are distributed through P2P, allowing them to be shared without delay. EOS.IO uses IPFS to implement the distributed storage, which is also the reason EOS.IO was chosen for the Maestro system. Developers using the EOS.IO platform put up a set amount of coins in order to guarantee the CPU and storage usage for the EOS.IO blockchain. As the holder of the Maestro tokens, Maestro allocates the profits generated by its platform to all other token holders. 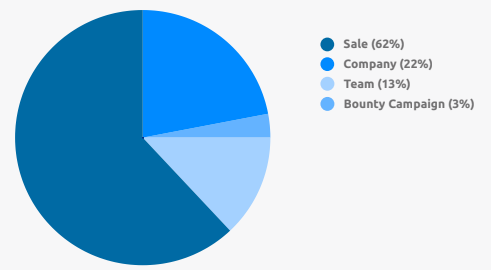 Maestro is also allocated with platform profits based on the number of tokens we hold. Part of these allocated tokens will be used to purchase and deposit EOS coins to ensure smooth Maestro system operation, leading to quality service maintenance and enhancement. Maestro will progressively upgrade the Maestro system, according to the development stage of EOS.IO. The Maestro team promises to lead the project efficiently and decentralize service operations progressively. We seek to address any of the problems or uncertainties found in other music platform projects, and hope to operate and expand our operation in a practical and rational method. The Maestro System is made up of two platforms, Ensemble and Symphony. These two platforms are connected to Maestro's blockchain through smart contracts, with all music files encrypted and stored in distributed storage. Ensemble: Community Mobilization Center for Artists and Fans. Ensemble will provide safe artists, and direct donation methods throughout for new or existing projects. Fans who contribute to the project, on the other hand, will be able to directly engage with the creative process of the artist they like best. The great composer believes that such an ecosystem will benefit both sides and open new boundaries for the artist - the audience. Symphony: Creator and Consumer Service Flow. The symphony will serve the world's music industry with a fair and efficient distribution system. Creators, on the one hand, will be able to take away the real profit that they deserve. Consumers, on the other hand, will love the online music service constantly, less expensive. Supported by the Interstellar File System (IPFS), which works on the EOS network, Symphony Orchestra will provide high quality music with a simple touch.